What a summer we had with Olympic and Para- Olympic excitement, Notting Hill Carnival , Thames Festival and summer holidays with a bit of brit sunshine!, WE at ScriptReadEAST welcome you back. Wow its been a busy summer ! 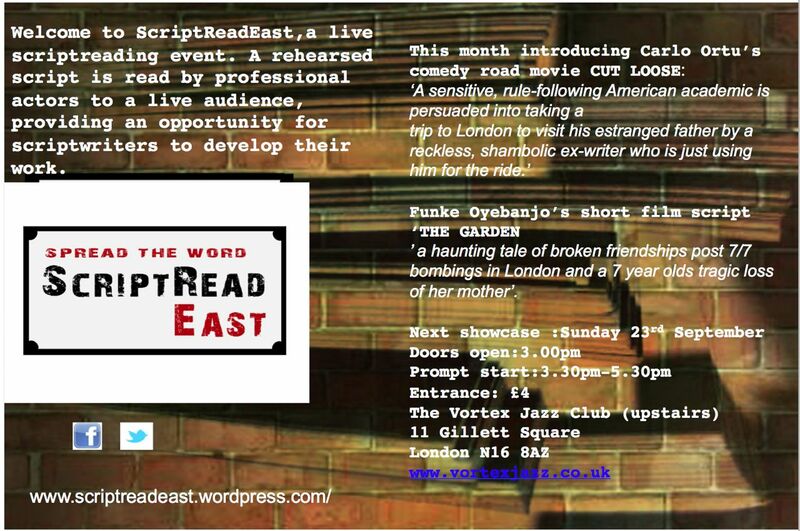 We had our last event at THE BOOK CLUB as part of the CINEAST festival , it was great to be amongst other cinephiles in Shoreditch ..A quick reminder of what we do …ScriptReadEast provides a platform for new writers to devlop their scripts by a live reading from our professional actors to YOU our wonderful live audience …Its a great way to hear new work , comment and support new writers..
We have our next live showcase to drive away any back to work or autumn blues and we are back at our Dalston home The Vortex Jazz Club. Shelly is a seven year old girl whose friendship and family is irretrievably shattered by the death of her mother in the London 7/7 bombings..
You may be a writer or an actor who would like to submit a script or join our actors pool – or you know friends or colleagues who would- SO PLEASE DO PASS THIS ON. We are really looking forward to seeing you all there . REMEMBER SUNDAY 23RD – SPREAD THE WORD! !